The bones of fossil vertebrates have been collected from many sites around the world. 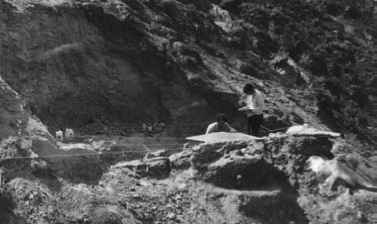 New localities are occasionally discovered by chance, but most excavation is now carried out in places that are already well known for their fossils. Collectors focus on rocks of the right age and of the right type. If they are seeking dinosaurs, they will choose to investigate rocks dated from Late Triassic to Late Cretaceous in age. They will, of course, search only in sedimentary rocks, and in particular rocks deposited in ancient lakes, rivers, or deserts. If their interest is fossil sharks, they will usually investigate sediments laid down in ancient seas. Large fossil bones are generally located by prospecting. The collector walks back and forwards over likely areas of rock that are being eroded away by water or wind, either in 'badland' areas or on coasts. Erosion is necessary to expose fresh remains. 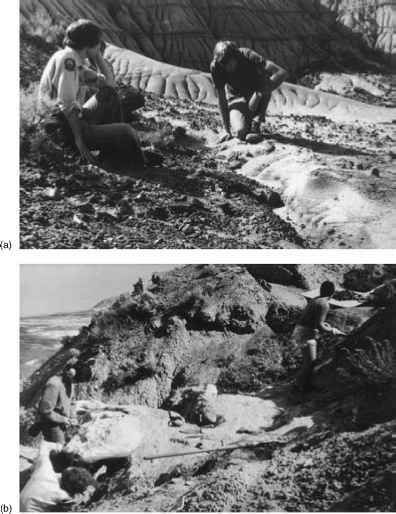 Once the collectors find broken and disturbed pieces of bone (Figure 2.1(a)), usually small fragments, they follow them back uphill to their source. There may be a portion of limb bone or a rib poking out of the side of the slope. Then the collectors must try to assess the nature and size of the specimen and how it is lying, so that they can plan the excavation. switch to smaller power drills, hammers, and small picks (Figure 2.1(b)). The skeleton is exposed from the top and the bones are cleaned up with needles and brushes, and protected with soluble hardening compounds. Throughout the excavation, the diggers note the arrangement of the bones, and any other associated fossils. The whole dig is often recorded on film. It is also useful to have a geologist present who can interpret the sedimentary context of the skeleton. Once the skeleton is exposed, it is mapped in detail (Figure 2.1(c)). 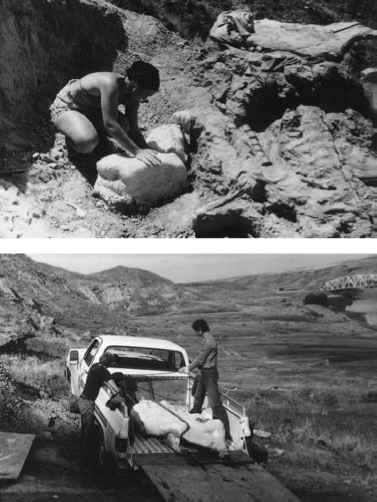 Fossil vertebrates are collected in many other ways. For example, fish specimens are often preserved on well-bedded rocks that were laid down in ancient lakes or seas. The rocks may be fine-grained, and they may break into large slabs. Collecting in these cases consists simply of splitting slabs, and saving those that contain bones. Many small fossil vertebrates are found only as isolated bones and teeth. In certain sedimentary settings, skeletons are tumbled together and broken up. The bones and teeth may be concentrated at particular levels, often in small channel-like pockets. In cases such as these, palaeontologists dig out the whole bone-bearing layer, and they may sieve it on the spot, picking out the identifiable bones and teeth, or they may transport sacks ofbone-rich sediment back to the laboratory for processing.